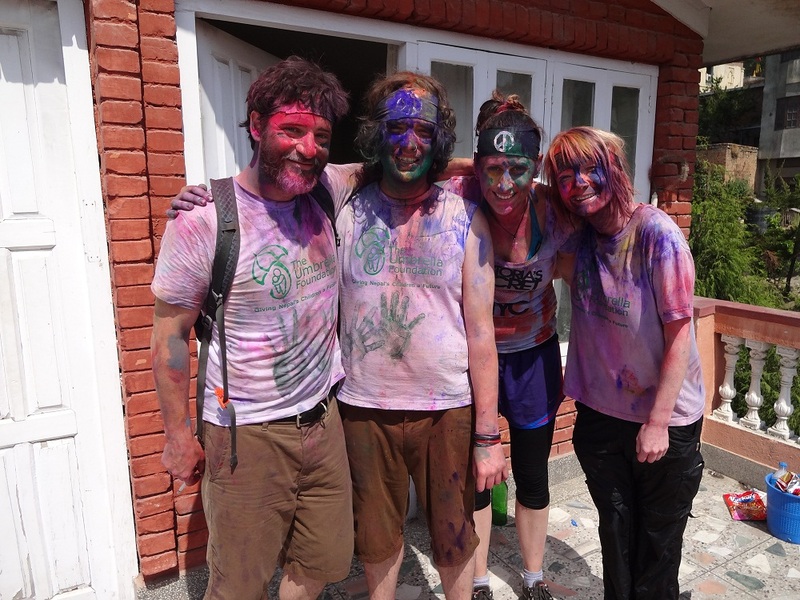 This past Tuesday was Holi, the Hindu festival of colors, and it might as well have been a battle. The festival traditionally involves throwing water balloons (and baggies of water) and then smearing colored powder on one another. I may not have been around for past years’ celebrations, but this year I think it’s fair to say that we took this festival to a whole new level. Just look at our prep work. Leading up to Holi, the kids had been doing a bit of trash talking. “I get you, Sister!” “I get you with MANY balloons!” And that, combined with the constant miming of a water balloon to the face (and the occasional stray actual balloon) made all the volunteers want to be prepared. We were up before dawn, waiting to attack the poor kids who had been assigned to pick up milk from the volunteer house that morning. Members of each of the five children’s homes came. 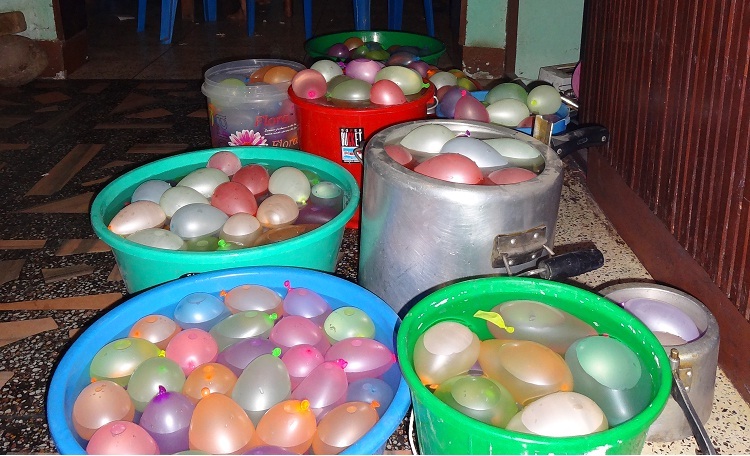 All of them left drenched from either water balloons or a simple bucket of water. And this was all before 7am. After the dawn attack, we, the volunteers, armed ourselves and prepared to attack house by house, before the final group battle. We had strategized the night before, and the first couple assaults went smoothly. And then we were ambushed. While attacking the third house – which was proving to be a formidable opponent – the boys of the first house joined the fray and penned us in. We fought our way out, but there were casualties – such as a point blank water balloon to the face and the loss of a bucket, a key battle tool. After regrouping and rearming at the volunteer house, we were ready for the final stand. 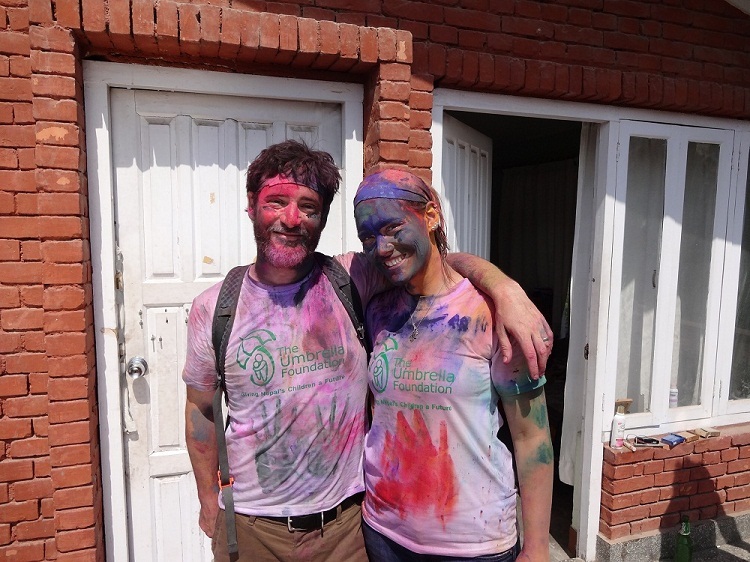 Until this point, we hadn’t used any of our colored dye, and neither had the other houses. But that all changed. The nicer kids came up to me with color on their hands, and gently rubbed it on my face while saying, “Happy Holi, Sister!” The more enthusiastic ones went for the sneak attack, which often resulted in ingesting the colored powder. Throughout the course of the day I was spitting in pink, blue, yellow, and green. By the time the battle was over – the balloons were gone, the water had run out, and we’d given as good as we’d gotten – no one had emerged unscathed. Just as it should be. There’s nothing quite like attacking children to bond a group of volunteers. And there’s nothing quite like covering someone’s face in dye to bond you with your kids. I don’t even mind that my hair is still slightly pink and purple. Remember how I promised photos? Well, that’ll have to wait a little longer. This past Sunday we were out at a festival in honor of Shivaratri at the Pashupati Temple, and I decided to get some shots of the celebration. I was hyper aware of the vast crowds, and of the possibility of pickpockets in such a jam-packed space. In fact, I was so paranoid about the pickpockets that I wouldn’t even keep my phone in my front pocket for easier camera access. Instead, I kept it in my purse, which was zipped and in front of me at all times. Toward the end of our time in Pashupati, I took just a couple more photos and put the phone away for good. As we joined the stampede to leave, I was effectively pushed through the crowd, but still managed to stay behind Husband, with my purse between us. Which means that this pickpocket was phenomenal. When we finally got back to the volunteer house, my purse was zipped and my phone was gone. There was no money missing, no IDs taken – just the phone. And with it, all the photos from the previous 10 days (and more if you count the touristy photos I took during our layover in London). I lost photos of my boys decorating crowns and posters for St. Patrick’s Day. I lost video of Husband’s boys dancing to Gangnam Style – and of me dancing with them. To say that I’m bummed would be an understatement. I’ve since blocked the number, and bought an actual camera, but my paranoia levels have shot through the roof. My purse is sitting on my lap as I type this, and I keep one hand on it whenever I walk by anyone. I know it’s not the worst thing that could happen. And I know that it’s better to happen at the beginning of the trip instead of at the end. But I’m especially bummed about those videos. Though, if I know these Nepali kids the way I think I do, it won’t be the last time they have a dance party. Not by a long shot. Note: I tried “find my phone,” but since my phone wasn’t set up to use internationally, and wasn’t online, it didn’t work out. Luckily, the passcode is on and the number’s now blocked. And the battery is probably dead by now.